This morning I decided to make a special "gourmet breakfast" to kick off the weekend. While many of us have enjoyed special "steak and egg" breakfasts before...this morning I kicked it up a notch. No, I actually kicked it over the moon and back! 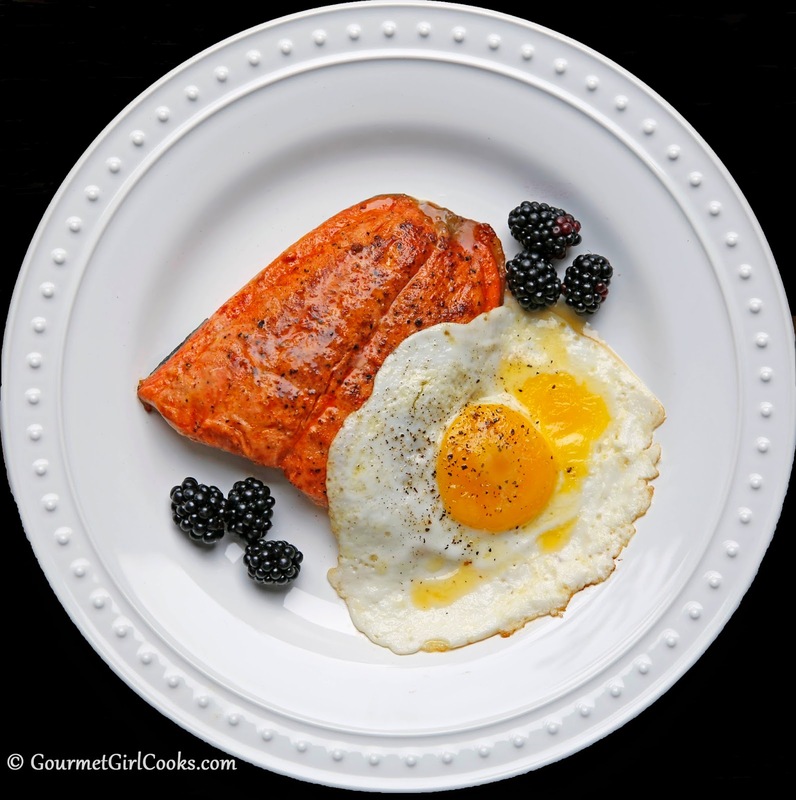 LOL I had one piece of fresh wild Alaskan Coho Salmon left in the fridge that was screaming "breakfast" to me (and personally, I'll take wild salmon over steak any day of the week). It was so very easy to make. To prepare the salmon: I seasoned the fillet with salt and pepper and dusted it with smoked paprika and pan seared it flesh side down in a nonstick skillet in a tablespoon of Kerrygold butter over medium-high heat for about 4 minutes. I turned it over and cooked it another 5 minutes, skin side down. I removed the skillet from the heat, covered it and set it aside. I then heated a separate small skillet and fried an organic cage free egg in a little more Kerrygold butter, seasoned it with sea salt and black pepper...and BOOM! I had the most delicious "Salmon & Eggs" breakfast. 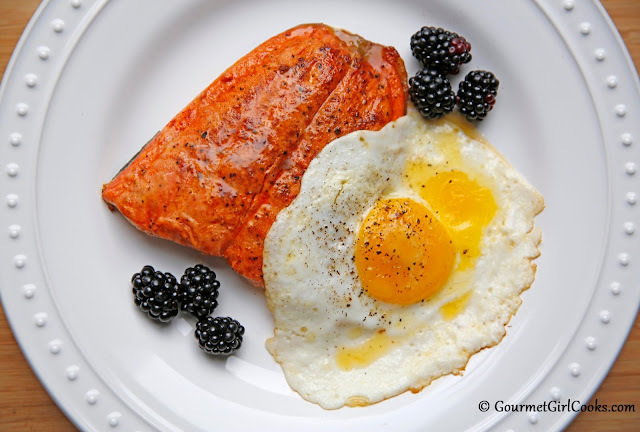 I tossed a few fresh blackberries on my plate and I was in "Salmon & Eggs" heaven. 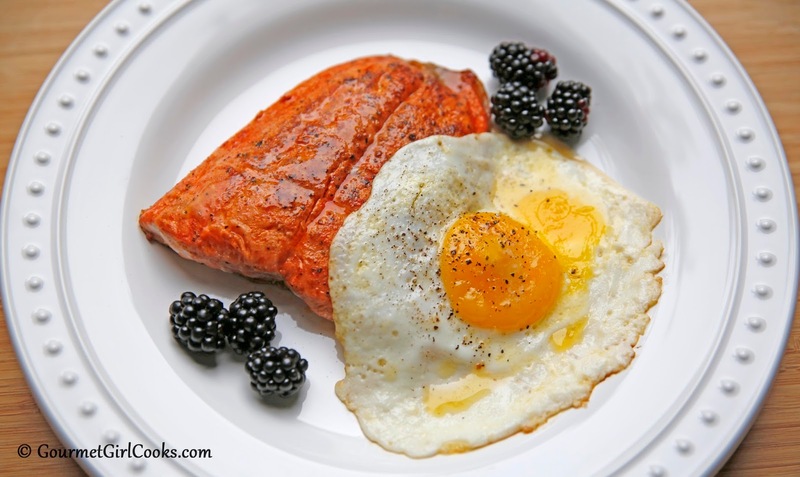 Move over steak...you don't stand a chance in my house as long as there's wild Alaskan salmon in my fridge! I snapped a couple photos below. Enjoy! This isn't just breakfast...it's ART!